Because that is true, it should come as no surprise that we believe the Studio Gang/Scape design of Tom Lee Park – one that transforms it from an ungrazed pasture into an actual park and a vibrant one at that – is the most spectacular plan for public space we’ve ever seen in Memphis. It’s an opinion that should not come as a shock to anyone. After all, we’ve been blogging for almost 10 years about the way that the present park is an embarrassment and denies what it wants to be: a spectacular park doing justice to the most spectacular view on the Mississippi River. It’s not as if it has not been an opinion shared by most Memphians who care about high-performing public space and believe that we should aspire to be nothing less than the best. Surely, we need look no farther than Shelby Farms Park – not to mention FedExForum, AutoZone Park, and Crosstown Concourse – to see how a commitment to outstanding design can unlock civic pride, inspire our aspirations, and catapult our national brand. In cities of all sizes across the U.S., waterfronts are being remade and their ability to spark new development and jobs has been conclusively proven. That said, we don’t have to look to Boston, Philadelphia, New York, Portland, San Francisco, or Chicago for inspiration. We can find it in our sister Tennessee cities of Nashville and Chattanooga. The East Tennessee city used its riverfront as the catalyst for new development, new investment, and a more prosperous downtown. The Brookings Institution in 2000 credited Chattanooga’s 21st Century Waterfront vision as the reason for the city’s turnaround from once being called America’s most polluted city into one celebrated for its beautiful riverfront. The city continues now, decades later, to make investments in the public space on its waterfront, which has become without question the most iconic image for Chattanooga. Meanwhile, the Nashville 21st Century Waterfront project will eventually be 10 times larger than the existing park that has been built so far with the city moving with a momentum, decisiveness, and a commitment to excellence that have defined it in recent years. And yet, both of these cities could only dream of the kind of riverfront that Memphis possesses – and has squandered for so long. Memphis has been talking for almost a century – from Memphis’ first comprehensive plan in 1924 by legendary city planner Harland Bartholomew to three recommendations in this century that called for a new design for Tom Lee Park. Mr. Bartholomew said it well 95 years ago: “Today, the riverfront is not merely unattractive, but represents a flagrantly unprofitably use of the property…the riverfront could be transformed into a picture of combined commercial and recreational activities truly representative of the city’s character and unsurprised in attractiveness in any other city.” His plan was followed by at least 21 other plans, and that’s just since 1973. Meanwhile, while we contemplated our navel, in only a decade, Nashville has moved from nothing to a green respite from country music and cowboy hats while Chattanooga expands its bold vision for its riverfront. 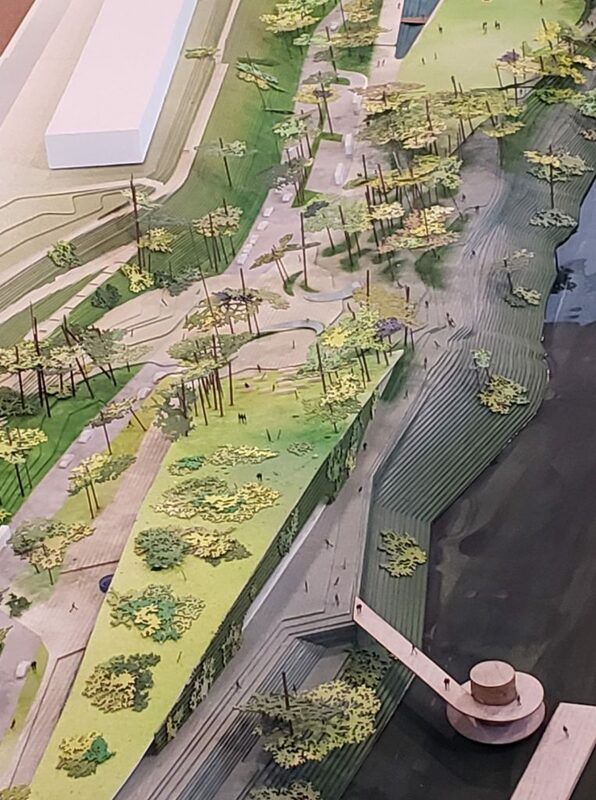 We say all this to make the point that Memphis cannot afford yet again to fail to make the most of its riverfront, and if there is any doubt on the potential, the importance, and the impact of this project, you need only visit the model of the design on display at Beale Street Landing. While the renderings previously released were persuasive, the model is conclusive. Put simply, this plan must be executed. More than any of the riverfront projects we’ve seen in other cities, this design amplifies the site rather than overwhelms it, the design feels organic rather than an artificial overlay seen in other places, and the design represents a deft touch that magnifies the natural setting and ecology rather than the theme park overdesign seen in some of today’s park designs. While there is much about the design that is appealing, if not captivating, the designers said their underlying approach was to draw inspiration from the river itself, and as a result, the design of the park was inspired by the river’s meanders, ecologies, pools, and currents, turning the barren landscape into a place offering individualized experiences with the park and personalized relationships with the river. The designers’ explanations about their planning principles and inspirations is convincing in its authenticity and in its sensitivity to who Memphis is. Despite this unrivaled opportunity for an archetypal riverfront, Alan Crone, Memphis Mayor Jim Strickland’s major domo, described a letter from the Metropolitan Hotel and Lodging Associated written to his boss that sounds like it was conclusions in search of a premise. Raising questions in a “sky is falling” tone, the Association appeared to suggest that two weeks of Memphis in May International Festival is enough for Memphis even when given a chance to make Tom Lee Park into a 365-day-a-year park with amplified vibrancy, energy, and economic impact. Here’s the thing: I was the longest serving member of the Memphis in May board in its history, I was involved twice in helping develop plans to prevent its bankruptcy, and I am proud of how it rose from its humble origins to become a valued regional festival. It is a classic Memphis success story, one of grit and determination and one based on exploiting assets unique to what makes Memphis so special in the first place, notably barbecue and music. I remember meetings in the festival’s early days – held in the Chamber of Commerce headquarters until the Chamber moved out as it faced closing – when a biracial group of young Turks were frustrated with the elitism of the Memphis Cotton Carnival and decided to create an organization that would bring the races together, that would reposition Memphis’ image in a global economy, and that would reposition Memphis in the national mind. Today, we often forget that this audacious idea came as Beale Street was boarded up, the Peabody Hotel was closed, the Chamber of Commerce was near bankruptcy, and the economy was going only in one direction – down. And yet, Memphis in May’s visionary founders like Lyman Aldrich, Tiffany Bingham, Harold Shaw, Mose Yvonne Hooks, and Joyce Blackmon and others decided to aim high and take fearless action with an unrelenting eye on the future. Come to think of it, that’s the same attitude we need now as we consider this historic opportunity to reboot Tom Lee Park. It’s also why there’s no reason to expect a festival that has devoted itself to the success of the city would now fail to support a park plan does just that. Looking at the model of the transformed park, it’s clear that large swaths of the park have been set aside for festival stages, and some park lovers have said that if the Memphis River Parks Partnership had been single mindedly focused on just creating a great park, it could have put these areas to better use. That said, an alliance between Memphis in May and Memphis River Parks Partnership is the logical course of action. Surely, looking over the model, most reasonable people would agree that there is a way for the festival to flourish within these gorgeous new surroundings and to be part of increasing the value to the public of this special place. And looking at the dimensions of the large three spaces reserved for Memphis in May, it’s hard to imagine that there’s not enough space. Festival officials told us a few months ago that they can live with a park plan if it provided them with space for 25,000 at the music festival. Depending on whether you use 4.5 square feet or 9 square feet for each concertgoer, there is space for 26,191 to 55,999 people. While serving on the Memphis in May board, I was also the longest serving member of the Memphis Convention & Visitors Bureau executive committee, so I have a personal appreciation of the association representing the hotel and motel industry. These hoteliers are a data-driven group willing to take smart risks to expand their businesses and have even shut down much of a property while retooling it. Hopefully, they will come to see that a park that protects their May spike in occupancy but adds room nights in the other 11 and a half months is in their best interest – as well as in the best interests of downtown restaurants and retail. Equally important, with FedEx Logistics, Indigo Ag, Servicemaster, and others moving downtown, a highly functionally, highly appealing Tom Lee Park is a competitive advantage in attracting and keeping the kinds of workers these companies need. Hopefully, all of this is compelling enough for hoteliers to understand that what’s good for the city is also good for their industry and what’s good for the park is also good for Memphis in May. 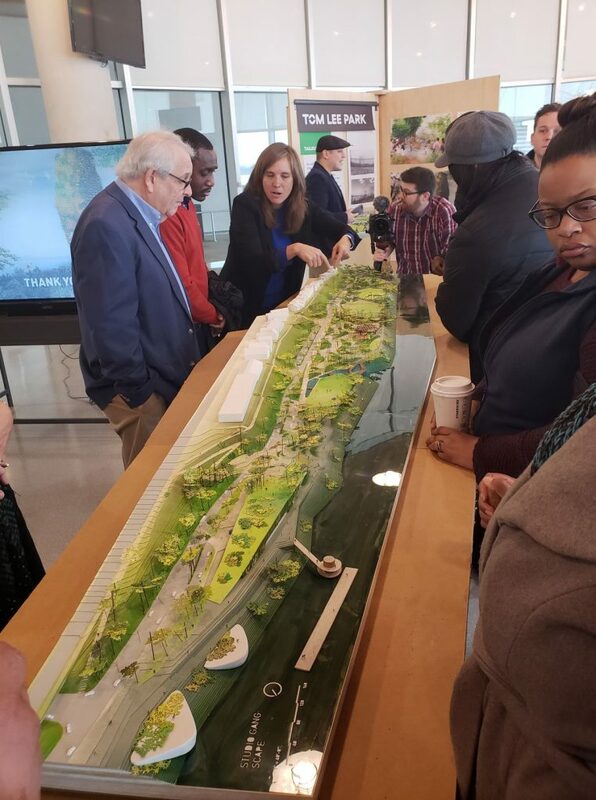 Tom Lee Park has remained essentially the same uninspiring place through the vicissitudes of 100 years, and surely, facing its third century, Memphis can leverage its renewed self-confidence and ambition to build the park as it is designed. I have close friends on all sides of this issue, but in a community where we make too many decisions based on personalities rather than policies and on fear of change rather than confidence in our potential, it would be tragic if Memphis does not succeed in capitalizing on this opportunity, not only because of the loss to the city, but because of the loss to Memphis in May in gaining a place to stage the festival that is unlike any we’ve seen anywhere else. I’ve attended music festivals in other cities that were held in fairgrounds, large open lots, or race tracks. They were the barest and bleakest public spaces – sort of like Tom Lee Park today – but here, Memphians and Memphis in May can do better and deserve better. When we first blogged about the importance of turning Tom Lee Park into a park, it was described to us by architect Frank Ricks as a moonscape, and when there was a discussion about changing the alignment of Riverside Drive, he had drawn up a rough idea of how “rooms” could be added to the park to break up its monotony and create several unique experiences. In 2013, in his recommendations to the City of Memphis, noted urban planner and author Jeff Speck did the same. He said that Memphis in May’s opposition to a previous ideas for improving Tom Lee Park was because they were not invited to participate in the planning, and that’s why city officials say they were intent on the festival being part of the current process. At the time, Mr. Speck said that based on his conversations with Memphis in May, there was no conflict between a better designed Tom Lee Park with “outdoor rooms” and the needs of Memphis in May. Memphis has never been the kind of city that is comfortable with change, but if our community is to compete with other cities, we should consider changing our ways in order to change the trajectory of the city. In this way, for us, this project is about more than Tom Lee Park. It is about whether Memphis is ready to act on the momentum that is just picking up steam. It is also about making the kinds of investments that cities that we envy make regularly because the simple fact is that if we don’t invest in improving our quality of life, why should we expect anyone else to? On a sunny spring day in May, 1925, the indominable and brave Tom Lee who against all odds saved the lives of 32 people when their steamer overturned near Memphis. A dramatic sculpture in the park pays tribute to the soft-spoken, uncommon man who became a national hero. The courage and self-confidence Memphis needs to transform Tom Lee Park pales in comparison to anything he displayed that other day in May that should give us a reason to celebrate each year, but hopefully, we too will rise to the occasion. Yet another well-written, thoughtful essay that helped me, as a relative newcomer to Memphis (only 18 years!) understand the history and the potential of the riverfront. Thanks. I’m sorry, but we’ve been hearing about the so-called redevelopment of the riverfront forever — and absolutely nothing materializes. What has been done with the colossal failures of both Mud Island and the Beale St Landing show how doing things on the cheap turn out. The redevelopment needs to be done correctly and that means doing it in small sections. Memphis doesn’t have an adequate budget for anything so I say start with a smaller part of the park, fix the errors made previously and then expand. Do it correctly. Memphis needs to learn to do projects that are not half-assed, as most in this city are always done. I’m hopeful, but also very skeptical we will see much progress at the riverfront for many many years. As a longtime MIM volunteer, I well remember it was often called Memphis in Mud. This is because the geniuses who pumped silt out of the river to raise the park level left it utterly flat. It needs to gently slope to the river so it won’t have standing puddles. More trees? Great. Electricity in the ground, great. Each of the three stage lawns ought to be slight amphitheaters for better viewing too. They are whining how there won’t be enough space for all the BBQ teams, but as it is now, big swaths of ground are empty so that every team has a concrete sidewalk at its front. Do teams need concrete? Will the ground be non-swampy if it drains right, and trucks won’t tear it up? Got to plan for that now. I need to head over to the Landing and check out the interactive model. Looks pretty amazing. I’ll be curious to see what all activities will be built into the lay-out. Laura: That’s why this design is so special. It’s not done on the cheap and it’s being done by designers recognized as the best in their fields. Because Memphis doesn’t have an “adequate budget” is why the fundraising is about private and philanthropic sectors getting financially involved. From what we’ve seen and what we’ve heard, this can never be accused of being “half-assed.” I hope you can get down to see the model and talk to people who can explain the nuances and philosophy behind it, which really impressed me. Dan: Thanks for the on-the-ground information. Aaron: Please let us know what you think. Beautifully written, Tom. You have such a long view on all sides of this, and I appreciate the way you have situated the current conversation and proposal in an historical frame. Change is hard. (Try raising $70M!) But I believe all of us who care about the success of our city will find ways to adapt and deliver a spectacular park for all Memphians 365 days a year and a phenomenal festival grounds. Say goodbye to great views and hello to traffic congestion. 1) The article mentions new offices moving downtown, how will they get their employees to work? Not everyone wants to move Downtown and many of the companies relocating to Downtown are moving from out east where they are raising families in good schools. Where is the traffic study to model Downtown growth and how the changes to Riverside Drive will impact traffic? 2) How will reducing Riverside Drive to 2-lanes provide better access to the riverfront? When Riverside was reduced to 2-lanes several years ago it made the road congested and much more difficult for pedestrians to cross. 3) If Memphis-in-May is impacted as many are now indicating, how will this project qualify for Tourism Development Zone Funding since there would be a net loss in revenue generated by the park? 4) Why is the design not able to be phased to allow Memphis-in-May to be accommodated in 2020? 5) How is the design going to stand the test of time when there are many that view the current park improvements as trendy and the signage as childish? The riverfront is s wonderful setting and asset. But the Memphis in May “Mud” festival has seen better days. The barebeque contest is just crazy in my opinion….Where else would this be popular and considered a point of civic pride? I’d rather do practically anything than stand in deep mud and bbq smoke and see many hundreds of obese people making fools of themselves. Ridiculous. The music acts they line up each year for MIM are definitely second tier acts. Someone stupidly canceled the nice little sunset symphony programs held each summer along the riverfront. What really disgusted us was the Beale Street Landing. No open restaurant or concessions, trash everywhere and really nothing to see there. I know it’s a fairly new structure, but it already looks run down. Anonymous: If you want to consider special views. check out the model at Beale Street Landing. The best views are from a real park. You say “Dynamic downtowns have high-functioning public spaces and attention to detail and design.” And you’ve written that “Tom Lee Park is the worst riverfront park in the country. OK, well, so we know how you feel about this. Not a huge surprise that you’d like all the Gang’s bells and whistles. So I got a question: Am I a philistine, or do I have bad taste, or do I just not believe in a “dynamic” downtown (whatever that means to you…), if I actually adore Tom Lee just as it is? Or instead am I elitist to think that the highest and best purpose of Tom Lee Park as a public space is for MIM events – which, by the way, sounds every bit as inclusive to me as the stuff planned by the Gang? You know, Tom Lee is not just some big flat pasture. It’s a connection between the whole city, not just downtown, and the world – the river being our gateway to the world. Have you not noticed that its size and shape do, in fact, mirror – or maybe “match” or “complement” would be better words – the majesty of the river at Memphis? And don’t you think the vistas available from the top of the bluff on the south or immediately to the west along the walk, are enhanced by the wide open park below? Or that the view from the park itself, as it stands now, is magnified by being between the Arkansas floodplain, the river (different in every season), the bluff and Memphis beyond? Is it necessary that every inch of public space be “used”? Where does the National Mall fit in your city-planning geek worldview? Isn’t it a valuable public “use” of a public space to be majestic or vast in its emptiness? Or to set off natural monuments like, oh, the river? And by the way, I don’t how folks like the Gang work, but, let’s assume, just for the sake of argument, that a simple open space like the park as it roughly is now, was, in fact, the best use of the park for Memphis. Would a group of professionals like the Gang have come back and said, “You know, our plan is to do nothing. Just plan a huge open space. We’re done here.” Have they ever gotten to such a result? I know nothing of them or their work or their field, but I do wonder, just as, to a hammer, every problem looks like a nail, I am forced to wonder whether to professionals like the Gang, every open space looks like a canvas on which to paint. Has this group ever produced a plan that goes in the minimalist direction, inspired by the surrounding setting and landscape, that I describe above? Lucian: You are well-traveled. How often do you see cities that are content to have a moonscape as its front door? How often do you see cities that set aside its most precious real estate for a festival? We know how Memphis resists change and likes to think that we are so different that we should just settle for average when we have the chance for something great. We know that’s not what you’re contending, but that’s how we see this. It’s an opportunity to have a riverfront that’s actually big league instead of an embarrassing reflection of our own inertia and lack of ambition. Studio Gang has worked around the world and as it shows with this plan, it has a deft touch that respects the natural ecology. God help us if this is the best use of those 30 acres. Here’s my take on things: Memphis in May is as stale as the Mid-South Fair was when it was the same old, same old every year. If it’s so great, why hasn’t it become something that has a national reputation instead of being a festival that’s merely adequate on its best day? I can go to musicfest to hear a band and I enjoy it and then I have no reason to take my family to Tom Lee Park for the rest of the year. and now we’re supposed to be excited that Memphis in May has snagged Cardi-B with her crude and obscene songs. Hell, if I want to go to a real music festival, I go to New Orleans. Now that’s a festival that matters. Here’s that lineup: The Rolling Stones, Dave Matthews Band, Katy Perry, Jimmy Buffett & The Coral Reefer Band, Chris Stapleton, Pitbull, Santana, Diana Ross, Van Morrison, Herbie Hancock, Tom Jones, Alanis Morissette, and dozens and dozens more. I understand the desire to improve Tom Lee, but this design screams “we’re doing waaaay too much purely for the sake of ‘ambition’ or ‘progress. '” There are aspects of this design that are flat-out ugly. I have a hard time believing the large observation deck on the southern-most part of the model won’t turn out to be a novel concept in theory that is actually an eye-sore once built. I echo some of the sentiments here that the wide open space provided by the park’s current shape actually complements the river and helps magnify the awe-inspiring size of the river. Particularly when viewed from the bluff walls. Best case scenario, this design will lessen that effect. Worst-case scenario, it depresses the overall views and makes the riverfront uglier than before. Again, that observation deck is tragically gaudy and will look awful. I’m also skeptical of Studio Gang’s designs in general. The redesign of the smaller northern park looks mediocre, and I have a feeling it won’t stand the test of time. The aesthetic looks like some new-age hipster take on the “Boxcar Children.” The look isn’t timeless, the structures look temporary, and the overall design runs the risk of looking dated and ugly in the not-so-distant future. I also have reservations that the designers are not being totally forthcoming about the design’s actual impact on MIM. I have seen claims that the design will actually increase the space for the festival. Based on an article in the Daily Memphian published today, that does not seem to be the case. 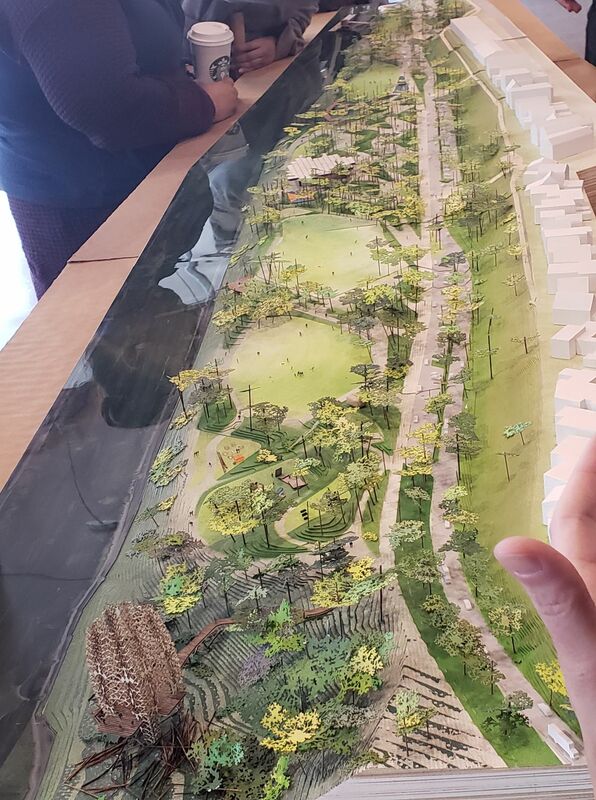 The model itself demonstrates a loss of space for a festival that requires usage of almost every square inch of the park for BBQ Fest and Music Fest. We should seriously tread lightly when it comes to risking a negative impact on one of the biggest tourist draws for our city, particularly when so much of our downtown economy relies on the tourism industry. Again, I understand the desire to want to improve the park. But this is doing too much. And doing too much for change’s sake is going to ultimately be a waste of money and a net loss for downtown. My two cents (and it likely doesn’t matter since it seems like this project is going full steam ahead regardless of public criticism) is that the design should be scaled back significantly. Doing much, much less will ultimately be doing more for downtown in the long-run. I’m betting you didn’t take the time to go talk to the designers when they were in town. They make good sense and everything you are concerned about has a smart answer. Only in Memphis would we moan that we are doing too much for progress. The earlier question was the right one – what other city has a mediocre flat land as its riverfront park. Only Memphis would ever act like that’s good enough for us. Lack of ambition here is a cancer, as proven by the last comment. The designers win the MacArthur Genius Award and do work around the world, but please don’t take away our open field. Maybe we can grow cotton there and get federal subsidy. Let’s get it done. It’s time to do something right. Memphis in May is a tired old festival and Tom Lee Park is the perfect image for a tired old city. 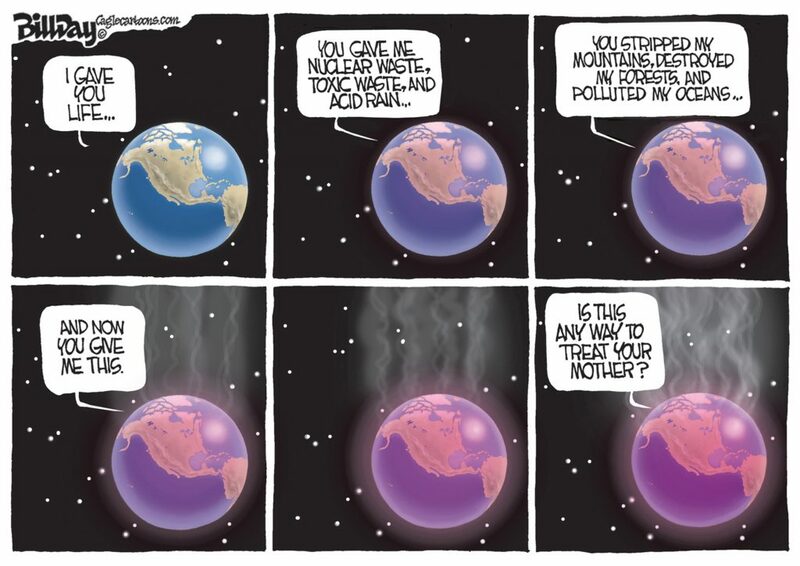 We can do better. I love the design. What can I do to help it get done? Anybody who loves Tom Lee Park, I have a field in Fayette County you’ll absolutely love to buy. 1. the user data showing how many (a) Memphians and (b) non-Memphians currently use Tom Lee Park on an annual basis, including Memphis In May events? 2. the projections you have that show how many (a) Memphians and (b) non-Memphians WILL use Tom Lee Park under the new design? 3. the economic impact data showing the economic contributions of Tom Lee Park to the local economy currently as far as private spending and taxes? 4. the economic impact data showing the economic contributions of Tom Lee Park to the local economy UNDER THE NEW design as far as private spending and taxes, including a treatment of any declines in MIM contributions projected? If we are going to be “smart” about this, I assume you have this data. Please share. P.S. : If you do not have this data, please explain why not. After all, the successor to the RDC is supposed to consider the factors in its decision-making on behalf of all Memphians, right? Here’s a factoid that’s pivotal, at least to me: Memphis in May’s own data shows that 6% of Shelby County residents pay to attend its events – and that’s treating each as individual customers rather than one who buys three-day pass. So for 6% of the people, we keep a park as is for two weekends a year rather than provide a park FREE for 100% for everyone. There’s hardly a need for anyone to use Tom Lee Park now, but based on my visits there, it’s largely local, and the new, better park should be for locals as well. Visitors are lagniappe. Economic impact for a new, improved riverfront is $1.01 billion over 10 years, and over 30 years, it generates six million feel of residential and commercial development, a benefit that we don’t get from the festival. The national consultants who wrote the economic impact study did the same for High Line Park and other parks and has a record for conservative projections. There is no reason to consider that there will be a decline the festival since the spaces handle more attendance that it’s ever had on its busiest weekend.